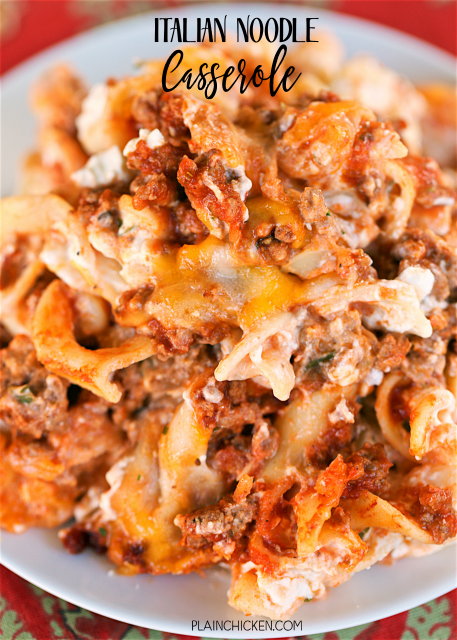 Italian Noodle Casserole - this was a HUGE hit in our house. Everyone cleaned their plates and asked for seconds! Even the picky eaters!! Hamburger, garlic, oregano, onion, Worcestershire sauce, tomato sauce, egg noodles, cream cheese, cottage cheese, sour cream, mozzarella and cheddar cheese. Can freeze for later. It is definitely going into the dinner rotation! 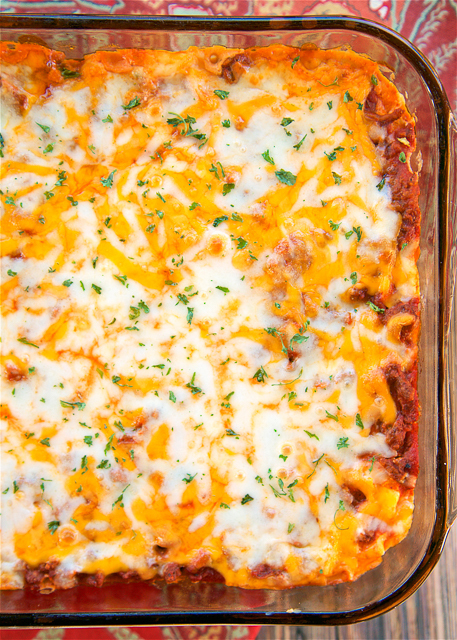 I am a sucker for a good Italian casserole and this Italian Noodle Casserole is no exception. It was AMAZING! It is kind of like a combination of my Amish Country Casserole and my Cream Cheese Lasagna. There are elements of each casserole in this recipe, and it is fan-freaking-tastic! Hamburger, cottage cheese, cream cheese, sour cream, tomato sauce, mozzarella and cheddar cheese. All my favorites in one dish! This recipe makes a good bit of food. It was enough for us to have it for dinner and reheated for lunch and dinner the next night. This would also make a great freezer meal. Assemble the casserole, cover it with foil and freeze it unbaked. When you are ready to cook the casserole, let it thaw in the fridge all day and then bake it. You may need to add a few minutes to the baking time if the casserole isn't 100% thawed when you put it in the oven. Cook the ground beef in a skillet until no longer pink. Drain. Add garlic, salt, pepper, oregano, onion flakes, Worcestershire sauce, sugar and tomato sauce. Simmer for 10 to 15 minutes. Cook egg noodles according to package directions. Drain and set aside. Combine cream cheese, sour cream and cottage cheese until smooth. Combine cooked noodles and cream cheese mixture. Spread in bottom of prepared pan. Top noodle mixture with meat sauce. Top casserole with mozzarella and cheddar cheese. Bake uncovered for 30 minutes, until bubbly. instead of cottage cheese could you substitute ricotta cheese to add a bit of richness to the dish? Yes, cottage and ricotta are interchangeable which each other. Mama Mia that looks yummy! Thanks for sharing! This was SO delicious! I added shredded zucchini and carrots to give it some veggies and my family loved it! Thanks for the simple recipe! Love your additions!! This is a great recipe to jazz up. So glad you enjoyed it! Could this be frozen? Any tips or advice if I tried to freeze this? Sure. Assemble the casserole and freeze it unbaked. Thaw and bake according to directions.